UEP reflects the varied interests of researchers in the project team but Dr Andrew Miles’ chapter on cultural participation in Manchester, published in Wolff and Savage (eds), Culture in Manchester. Institutions and urban change since 1880, is perhaps the closest there is to a ‘founding text’ for the project. Andy introduces the chapter below. 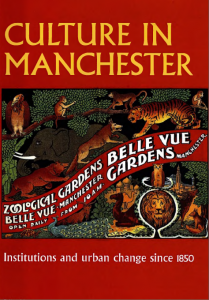 To read the chapter, please click on the image to the left, courtesy of the editors and Manchester University Press. Initially, Mike Savage, Tony Bennett (CRESC’s founding directors) and I were interested in researching Manchester’s cultural elites but as the principle behind HEIF was to furnish collaborations between academics and public and private sector organisations, I began by asking the leaders of the City’s institutions about their interests in and priorities for research. This was a period marked by the peak of New Labour’s technocratic experiment in cultural policy that explicitly linked funding to instrumentally-driven targets; and what soon became evident was their pragmatic attachment to audience development. In short, they wanted to know more about how to attract the ‘culturally disengaged’. The research subsequently revealed that this term is effectively a misnomer. The ‘non users’ of cultural institutions in Manchester were, in fact, often found to be highly engaged. They were either what I call in the chapter ‘ghostly participants’ in traditional cultural activities taking place in their own homes and neighbourhoods, and thus under the radar of the technocrat’s measuring devices, or participants in a rich and creative ‘everyday’ culture, centred on informal activities and relationships. This, in turn, raised a number of key questions about what it means to participate (and who decides), where participation takes place (including the importance of place to participation), and the personal, social, cultural and economic ‘stakes’ that attach to participation. These are the questions at the heart of the UEP project. ‘Culture, participation and identity in contemporary Manchester’ is based on research into the so-called ‘non-users’ of cultural institutions. This became the focus of work on and with Manchester’s cultural sector that Andy undertook at the ESRC Centre for Research on Socio-Cultural Change (CRESC) in 2005-08 that was funded by the Higher Education Innovation Fund (HEIF). This entry was posted in researcher posts by Andrew Miles. Bookmark the permalink.